Innovative design and custom, practical strategies begin with quality materials. We use clear cedar, composites, hardwoods, bluestone and Abbotsford paver products from established and well-known Seattle metro area companies. Some of our partners include Catalyst Lumber, Cross Cut Hardwords, Dunn Lumber, Issaquah Lumber, Plywood Supply, Cadman, Evergreen Building Supply, Marenakos Rock Center, Mutual Materials, Lakeview Stone and Garden, Rock Mountain Products and Trendset Concrete Products. The natural materials of wood and masonry provide a beautiful variety of colors, textures and shapes that allow for endless patterns and possibilities for a unique and distinctive design.We select the best materials because the cost differentials are so small. 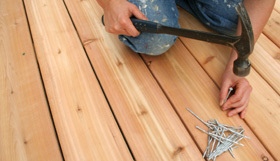 We use quality materials that will survive in all kinds of weather conditions. For example, we use over four inches of concrete in our patio installations. On driveways, we use tumbled paving stones to capture the natural look without problems with heat retention and deterioration during freeze and thaw conditions.We build granite countertops in outdoor kitchens, mainly because it will survive all kinds of weather fluctuations. Our experience shows that using proper quality materials extend the life and durability of your patio, fireplace, driveway, fence or deck. For further information or to schedule a consultation, call 425.868.4114 or email us.